any advice on how i could make this better? I am writing up some suggestions and will post soon. I would first implement something to keep track of the score. 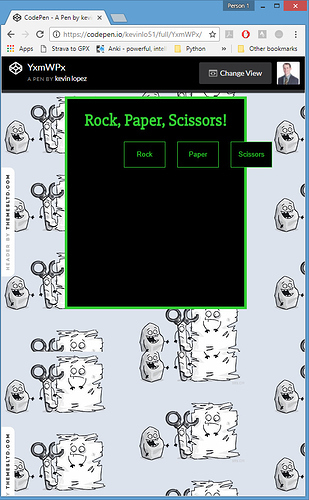 Then, maybe set a timer for the end of the round / how long the string lasts in the <p> element and make the buttons disabled until a new round starts. Then the feedback can disappear, the selected border goes back to normal, and a new round begins. Also, instead of having three different button click event handlers, I create one click event handler for the div with id=“center”. Since there was three button elements and one h1 element, I had to use the fact the buttons were given IDs and checked for a non-blank id to confirm it was a button element clicked and not the h1 element clicked. You could simplify this more by only putting button elements in that div. You had a lot of repeated code in the checkWhoWon function (19 lines) which is now only 8 lines. The main difference you will see is how I used the thisBeats object for determining who won. 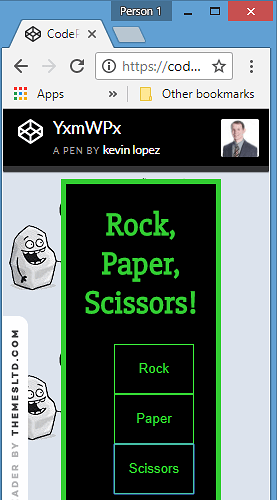 Each object property (rock, paper, scissors) represents what the usersWeapon is and the value of the property represents what it beats. This one line of code below allowed me to get rid of almost all of your if statements. The above uses a ternary operator and checks if the thisBeats object’s value for the usersWeapon is equal to the botsWeapon. If these two values are equal, that means the bot was using a weapon that is beatable as defined in the thisBeats object (hence the user wins), otherwise the bot wins. The only other refactor was simplifying your random number logic which is now use to select one of the keys in the beatsThis object. If you have any questions about the logic I used, let me know.